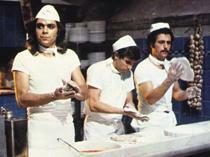 Overview - A group of immigrants from the south of Italy live collectively in the Milano's suburbia in the 1974. Not only they share the house, but also hopes and troubles that in those years where part of the Italian society. Loves and fights among them are the mirror of the difficult environment in which the poor south Italians found themselves in the 70s in the industrial cities of north Italy. In Lina Wertmuller's 'All Screwed Up,' life for her eccentric but lovable characters is often rather, well… all screwed up. A riotous comedy fueled by the director's unique voice and penchant for goofy charm, the film is also home to some occasional bursts of sobering insight. Episodic in nature and a little uneven, the movie is elevated by its charismatic cast, irresistible humor, and interesting camera work. Full of bizarre but not quite unrealistic characters, and a surprisingly weighty finale, the film offers a healthy dose of laughs and even a few thought provoking moments. Its various disjointed pieces may not always gel together, but with a title like 'All Screwed Up,' maybe they're not really supposed to. The story follows two young men, Gigi (Luigi Diberti) and Carletto (Nino Bignamini), as they move to Milan to try and find work and make it big. Out of place and without direction, the two move from odd-job to odd-job struggling to make their way up the ladder. Living in a communal apartment with an eclectic group of women, the men also embark on a series of romantic misadventures. Though leading chaotic and unpredictable lives, the pair just want to enjoy a carefree, stable existence, but it would seem the world has other plans in mind. Carrying Wertmuller's trademark knack for goofy, slapstick humor and amusing romantic comedy, the film is pretty funny throughout. As in the director's stylistically similar effort, 'The Seduction of Mimi,' the characters' various, exaggerated facial expressions are a real highlight. Absurd, but not quite outrageous, the protagonists and their friends are all appropriately bizarre, but still retain a certain amount of realism. Episodic in structure, the script mostly follows Gigi and Carletto as they try to find wealth and happiness. This usually backfires, and watching the duo work various jobs -- including tasks involving produce, meats, a busy restaurant, and a particularly amusing attempt at a life of crime -- are all pretty entertaining. Throughout the proceedings, the director employs an energetic visual style that helps to enhance the comedy. Sequences are often cluttered with activity, and a few sustained shots help to boost the movie's constant air of chaos. Close-ups of the various characters' unique faces and reactions place an occasional exclamation point on particular beats, and inspired staging and blocking reveal a brilliant sense of cinematic timing (one sequence involving a precariously positioned television is particularly noteworthy). The restaurant scenes are also full of interesting stylistic choices, and Wertmuller unleashes a kinetic, frenzied visual form. The hectic kitchen atmosphere works as a metaphor for the characters' own screwed up situations, and the camera work cleverly reflects their emotional state of mind. The movie's climax is impressive as well, and features a masterful twirling shot that brilliantly brings the director's visual themes full circle (figuratively and literally). Luigi Diberti and Nino Bignamini are both hilarious and endearing in their roles. As Gigi, Diberti is a typical womanizing, directionless louse. One scene, involving a botched robbery attempt, showcases some hilarious physical bits from the actor and may be the movie's funniest sequence. In contrast, Bignamini's Carletto is much more practical and committed. His relationship with the adorably mousey Adelina (Sara Rapisarda) provides the movie with its main romantic storyline and their struggle to find domestic complacency is full of humor and drama. Speaking of Adelina, Sara Rapisarda is very funny in the role, and her character's exaggerated overreactions are both annoying and side-splitting. The film also features a large ensemble of secondary characters, leading to a motley crew of oddballs that come together to form a dysfunctional family of sorts. While the movie can certainly be funny, the narrative and tone are a little uneven. Certain subplots dealing with secondary characters aren't always compelling, and some more overtly dramatic sequences feel a little out of place. Likewise, not all of Gigi and Carletto's misadventures are created equal, and some stretches aren't as amusing as others. Characters have a tendency to scream and argue, and while this leads to some humorous moments, the non-stop yelling can get tedious after a while. The movie's surprisingly solemn conclusion works well to further the director's underlining themes, but clashes a bit with the rest of the runtime. Taken on their own, many scenes work rather well, but when it's all put together the movie starts to meander and feels a little listless. 'All Screwed Up' does have its fair share of problems, but the film's goofy, satirical charm is often irresistible. The sobering drama can feel out of place at times, but the script's manic tone isn't always a bad thing. The characters are endearing, the goofy comedy is funny, and Wertmuller does manage to hit on some deep themes dealing with parenthood and the inherent madness of life. While the film's striking climax is powerful on its own, when placed into the movie's larger context its message feels a tad muddled. It doesn't reach the level of importance certain scenes appear to strive for, but is an entertaining and worthwhile ride. Kino brings 'All Screwed Up' to Blu-ray on a BD-25 disc packaged in a keepcase. After some logos and warnings the disc transitions to a standard menu. The movie is provided with a 1080p/AVC transfer in the 1.85:1 aspect ratio. While it avoids the artifacting found on Kino's other recent Wertmuller release ('The Seduction of Mimi'), the video presentation is still fairly underwhelming. The source print is good shape with only a few minor specks and vertical lines visible from time to time. Light to moderate grain is present, and unlike 'The Seduction of Mimi,' looks mostly natural. Unfortunately, clarity is rather mediocre, and the image has a soft look with occasionally murky fine details and textures. There is never any real sense of dimension or pop, and the picture often appears a little hazy. With that said, several close-ups of characters' faces are quite striking, revealing little nuances in their often exaggerated expressions. Colors are solid but a little subdued, featuring a palette of pastel hues. White levels are natural and well balanced and blacks are decent but a little muddy and elevated. Though free of any major technical issues, the image is far from impressive. Still, the transfer is seemingly authentic and given the print used, I doubt the movie could have looked much better. The audio is presented in an Italian DTS-HD MA 1.0 mono track with optional English subtitles. Flat but serviceable, the mix can get a little jumbled when there's a lot of activity. Dialogue is easily heard but has a thin, hollow quality. Score and effects work are decent within the single channel, but when there's too much going on in the track with lots of characters screaming all at once, the sounds start to clutter together, lacking distinction. Range is rather flat but there are no major instances of crackle, hiss, or pop. The mono mix can sound a bit messy at times, but speech remains audible. Limited by the source recordings, the track is decent enough. Stills Gallery (HD) - A gallery of ten stills from the film is included. 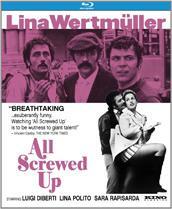 While it’s a bit uneven, Lina Wertmuller's 'All Screwed Up' is still quite funny. The mixture of drama and comedy doesn't always gel, but there are some solid insights and the movie has a certain goody charm that makes it worthwhile. The video transfer is free of any major problems but the image still leaves a bit to be desired. The audio is serviceable but limited by its source. Unfortunately, the only supplement we get is a pretty skippable stills gallery. The movie isn't a total success, but there are enough genuinely amusing moments peppered throughout to warrant a look.